Situation: We want teachers using a Google doc for planning so they can embed it on our community site and others can open it and see the work in progress or collaborate during the planning process. This was working well for standard unit plans. We created this template and teachers have been using it. But now that people are adding “guide to making judgement” (GTMJ) documents as part of their units, we have found it impossible to recreate these as Google Docs. Well it turns out you don’t have to. Desktop Google drive allows people to work and save in Word and share this with peers as viewers or editors. Note: Only follow the steps below on your own PC/Laptop NOT on a shared device. Step 1: Open your Google drive in the browser and click “Download drive for PC”. Then follow the prompts to install this on your device. Step 2: Once it is installed (and assuming you are using a Windows device) go to “start”, “documents”. 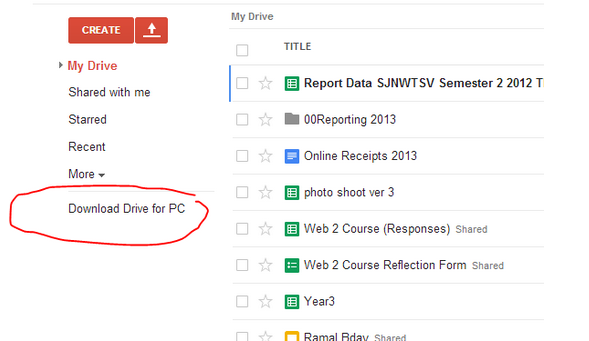 You will now see all your Google docs and folders appearing on your desktop like a P: G: C: or H: drive. The beauty of this is that when you find and open a Word doc from your PC Google drive, it just opens in Word (not in the Google viewer). If you are an editor of a file, any changes you make and save just go back to the original document. 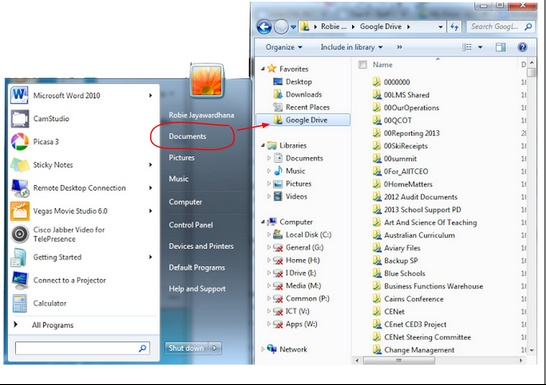 It also means when you create a Word doc, you can “save as” from Word direct to your Google drive. But to share it, you may need to open it in the browser and use the “sharing” icon. See below. Here is the GTMJ document in word. When you click on the link, it opens in the browser in Google Viewer, but to edit it, I have to download . Then I would have to edit and re-upload. But if you open it by tracking it down in Google Desktop Drive, it just opens in Word. All TSV staff can edit and all CENet staff can view. You are all seeing my live version of this file. Any change I make, You will see. Practice: Create a Word file, a Powerpoint file and an Excel file. Save them direct to Google drive from Word, Powerpoint and Excel respectively. Adding a link to my GTMJ on my unit plan. 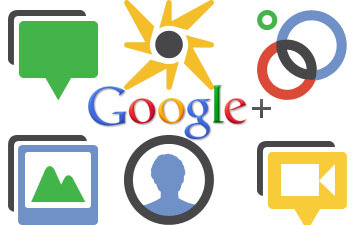 This document is now in your Google Drive. It now has a URL. Copy the URL by finding the document in your browser version of Google Drive. Tick it, then go to "sharing", then copy the link. Now open your Unit Plan and paste the link at the bottom. This way your Unit Plan and your Matrix are together.